With all we're hearing about the benefits of drinking tea, more and more people are putting down that coffee mug and opting for a brisk cup of tea. Jokari's Healthy Steps Total Tea Infuser is the splendid way to brew a cup of tea using either loose leaves or bagged tea. The cleverly designed spoon hopper allows you to measure, swirl and steep your favorite tea neatly and without messy tea leaves in your cup. And, the handy built-in plunger is great for pressing teas to release more flavor. If you're feeling creative, why not add a little cinnamon stick, orange peel, fresh mint or cardamom to the Total Tea Infuser along with the tea of your choice? 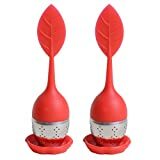 Jokari's Healthy Steps Total Tea Infuser measures 1.6 x 1 x 7.5 inches overall - the adept size to carry along wherever your tea adventures may take you! For over 40 years, Jokari has held a special place in its heart for gadgets; today, they specialize in providing affordable solutions to common problems faced by consumers. From unique kitchen gadgets and household storage and organization solutions to their Healthy Steps kitchen tools designed to help with portion control and healthy eating, Jokari is committed to creating useful and often crazy looking "thingamajigs" that are fun, colorful and easy to use. Modern tea stick infuser. Fill with your admired tea and swirl in hot water to infuse. Designed for loose leaf tea by Floz Design of Germany. Superior design and results for fuss free tea Sediment free tea thanks to our superior all round extra fine mesh Suitable for hot and cold drinks No messes; lift gently from the double handled edges and place on the drip tray coaster Easy to clean; just a quick rinse under the tap Polished and branded drip tray coaster lid. Boxed and ready for gift giving No chains or caps falling in your tea, as is common with tea ball strainers No silicon or plastic taste left behind EBook bundle A specially made, print ready ebook just for you! Tea brewing and tea storage tips Tea beverage recipes Buy two or three – one for home, one for the office and one for a friend or loved one. Add to your cart now while supplies last! LuvlyTea - Makes Everything Better! Features 304 grade stainless steel is rust resistant, lead and chemical free. 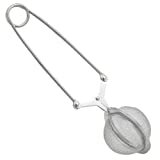 Perfect for tea strainer and steeper. 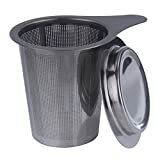 Ultra-fine mesh traps debris and keeps your tea particle free. Secure locking lid ensures a worry free steeping experience. Ideal size for single cup servings. 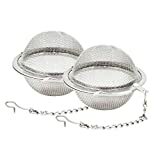 Pack of 2 infusers, including 2 drip trays and 1 spoon. LIFE TIME WARRANTY We are confident that our LuvlyTea Infuser will provide years of worry-free use. You can buy with confidence knowing that it comes with a Lifetime Warranty, which covers any workman defects and material.